The update is here - NXTMemo is slowly but surely progressing from childhood towards adolescence. Youtube and soundcloud only need the identifier of a video / track. 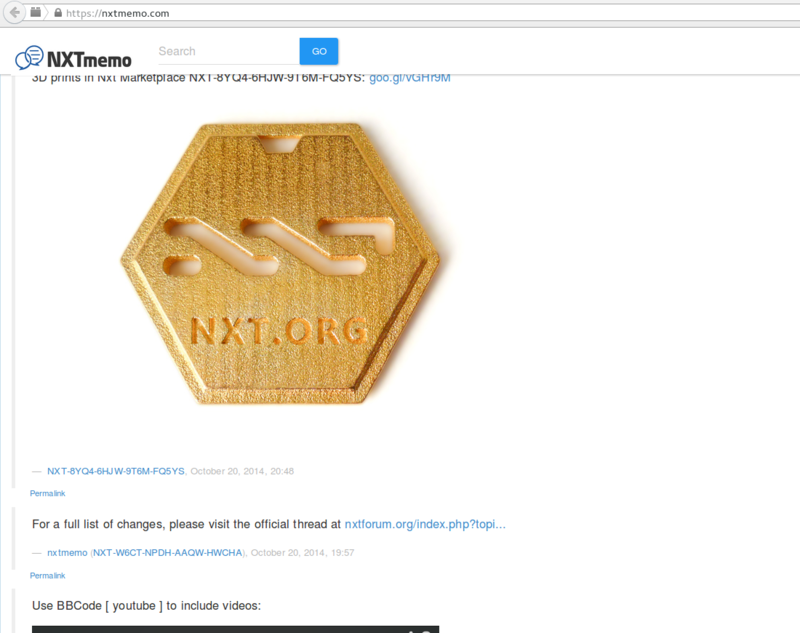 This little project has been received quite well by the Nxt community, which has motivated me to keep working on it. Next major step will be an integrated wallet and full integration of the marketplace functions, in order to make the Nxt marketplace more accessible to the public. There is still a lot of work to be done, but soon it will be time to start thinking about how to market and promote this site. If you are interested in actively supporting this project, please get in touch with me via PM. There will also be a fundrasing round on the Nxt AE - more details soon. i think i have a bug, maybe due to the image that the top message contains. this is scrolled all the way up. text is slightly cut off. i'm using firefox. Nxtmemo looks really good so far, great work. as for the client, you might want to consider just adding a plugin to my jay wallet modular wallet once its done. I'm still in early development, but it should be able to do what you want pretty easily. PM me if your interested in doing this. Clearing the browser cache should fix it. a minor thing: i was searching the site by putting an address in the search field and the box is a little bit too small to display a full nxt adress. might just be me, but i always find myself triple checking/redoing copy paste etc in these situation. i think it should be just long enough to be clearly visible for the most common search cases, like searching for an address. website is offline. very sad to see. last commit was more than one year ago! What about releasing as NXTPlugin?